Nags Head boasts more than a dozen hotels, motels and inns, which range from small one-story lodges to high-rise oceanfront national chains. Because of this large number of hotels, and varying locales and sizes, Nags Head is one of the most popular destinations for long weekend vacationers or small families and couples who want a little room by the beach to call their own. The hotels in Nags Head are typically clustered together in a few distinctive locations, with each region appealing to varying Outer Banks lovers. Beach Road - Most of Nags Head's hotels are located along the "Beach Road" or NC Highway 12. This location means that these establishments are within an easy walk to the beach, and are essentially a block or less away from the oceanfront. In addition, hotels and motels on the Beach Road are close to a world of restaurants, shops, and nightlife, and often have their own restaurant or bar on-site. Accommodations in this region also vary greatly, from small motels that have been standing strong for 50 years or more to larger, multi-story national hotel chains. South Nags Head - While South Nags Head is primarily home to vacation rental homes, there are a very small handful of hotels which are close to this region's intersection with the Beach Road and the Beach Bypass. This includes one of the larger hotels in Nags Head, a large oceanfront high rise that's convenient to US 158 and US 64 / 264. Washington Baum Bridge - A pair of hotels are located on the skinny causeway which stretches across the Roanoke Sound, connecting the town of Nags Head with the town of Manteo. These hotels are small but incredibly close to the water, and as a result, are good fits for anglers and mariners looking for a quiet place to stay for a night. These two hotels are also close to several noteworthy restaurants, as well as the big Roanoke Island attractions like the aquarium, the Elizabethan Gardens and Roanoke Island Festival Park. 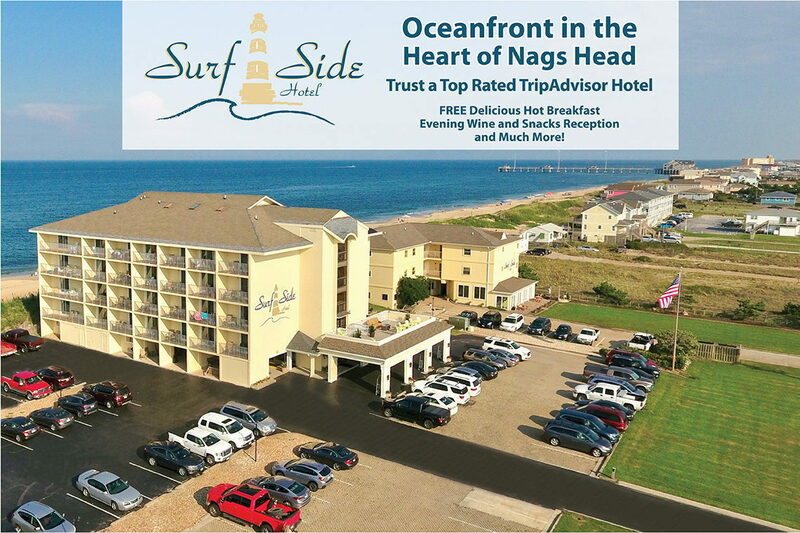 Nags Head hotels are best for couples and small families who are staying for a night, a long weekend, or even a week's vacation. The majority of Nags Head hotels offer community pools, game rooms, on-site restaurants or snack bars, easy beach access, or all of the above. Rates at Nags head hotels vary by season, with many hotels offering noticeably cheaper nightly rates on weekdays, and on off-season weekends when the beach is colder and fairly deserted. A handful of smaller hotels close up shop for the winter - generally from Thanksgiving or Christmas until early spring - but the national chains and larger hotels stay open all year long. The majority of hotels, motels, inns and even B&Bs in Nags Head have individual websites which outline amenities, seasonal rates, and offer online booking. This makes it easy for potential guests to view at a glance if a room is available for their desired weekend. Smaller motels, or classic historic motels, may have limited websites without online booking, and must be called directly for inquires or to secure a reservation. Summer and holiday weekend visitors will want to reserve a room well in advance - at least 2-3 months before an intended arrival. Despite the large selection of hotel and motels in Nags Head, these accommodations are very popular and fill up quickly, especially over 4th of July, Memorial Day Weekend, Labor Day Weekend, and other popular beach vacation times. Shoulder season and off-season visitors have much more flexibility and can often find a number of open hotel rooms just days before their stay. Many hotels and motels in Nags Head offer discounts for AAA members, military personnel and veterans, seniors, or all of the above. Call ahead or check the respective website to see if any discounts apply.